You can now create Matterport 3D virtual tours using the affordable Insta360 One X ($399 with free invisible selfie stick; reviewed here) or Ricoh Theta V ($399, reviewed here) instead of a $2,495 or $3,395 Matterport camera! Matterport is also introducing a new $9.99 “Starter” subscription for supported 360 cameras beginning in March 2019. By comparison, the regular Matterport subscription is $49 to $149 per month. You can request access now at matterport.com/register. Matterport has also decreased the price of its scanning cameras, now starting at $1,995. Meanwhile, Insta360 is also working on adding integration with other virtual tour platforms such as Kuula and Matterport competitor Cupix. SUNNYVALE, Calif. and NEW YORK – Jan. 28, 2019 – Matterport, the world leader in 3D capture technology and data, today unveiled Matterport Cloud 3.0, a subscription-based platform that puts 3D capture in the hands of businesses and individuals worldwide. The company’s new cloud software platform enhances the power of Matterport’s flagship Pro2 camera, and enables new users to transform panoramic and 360-degree imagery from spherical lens cameras into Matterport 3D – fully immersive 3D models. A breakthrough in its category, these new capabilities in 3D capture are made possible by the advancements in Matterport’s AI-powered image-processing technology, known as Cortex. Cortex is trained on Matterport’s world-leading dataset comprising billions of 3D data points, and can construct stunning 3D models from two-dimensional images captured with spherical lens cameras, including Ricoh Theta V and Insta360™ ONE X. This new class of cameras, which start at under $400, provides a low-cost, entry-level solution for the capture, creation and publishing of 3D experiences. 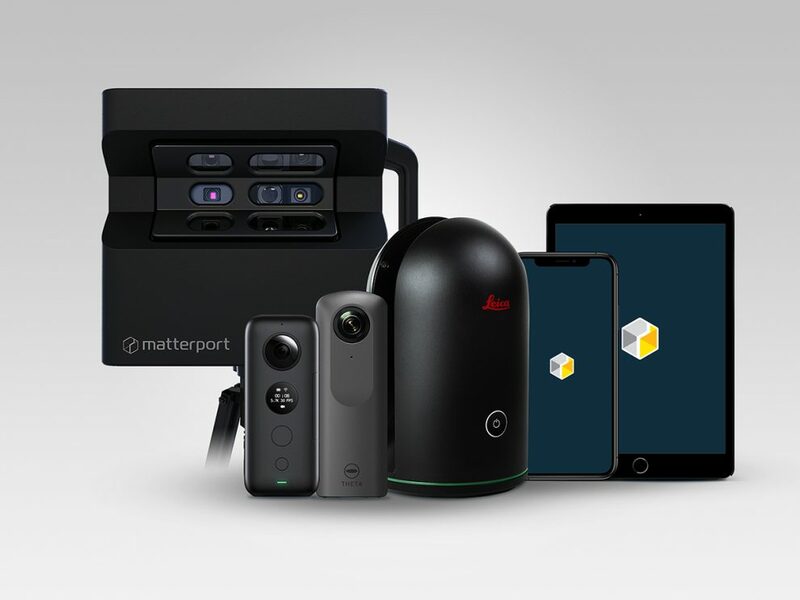 Matterport Cloud 3.0 expands Matterport’s ecosystem of professional 3D capture – adding to Matterport’s Pro2 camera line and the Leica Geosystems BLK360 laser scanner – making its revolutionary 3D experiences accessible to a significantly wider market. The new offering is for customers who don’t require the accuracy, performance and image quality of Matterport’s professional products. In addition to these important advancements for Matterport Cloud 3.0, the company is committed to thoughtfully opening up the platform to the broader developer community starting this year. This will bring an entirely new suite of functionality to Matterport’s customers for both new and existing 3D spaces. Cortex, Matterport’s industry-leading AI engine, has the unique ability to transform 360-degree images from spherical cameras into immersive 3D experiences using machine learning algorithms based on Matterport’s unique dataset comprising billions of 3D data points. Cortex includes three-dimensional intelligence that can understand objects, rooms and the detailed characteristics of a space; automatically choose well-composed photos; and label specific rooms on a floor plan. Workshop 3.0 – Matterport’s core image editing environment now has a more intuitive user interface and better organization of features and controls. Showcase 3.0 & SDK – Released with dramatic increases in both speed and performance, especially when rendering large-scale 3D models. Capture App 3 – Matterport’s all-new version of its 3D capture app (in beta) now runs on both iPhone and iPad to seamlessly guide and manage the 3D scanning and uploading process across all compatible hardware devices. It includes user interface enhancements based on feedback from existing customers as well as many other speed and performance improvements. Matterport’s new suite of 3.0 software: Cloud, Workshop, Showcase and Capture, are all available to Matterport’s existing customers in beta starting today. Matterport will be releasing a new feature-packed free trial option and a $9.99 “Starter” subscription tier for supported 360 cameras beginning in March 2019. Early adopters and existing users of supported 360 cameras can request access now at matterport.com/register. Matterport is the world leader in immersive 3D technology, offering a platform for prosumers and professionals to easily capture, edit and share 3D models of physical spaces. These navigable virtual tours are presented in Matterport’s proprietary photo-realistic digital media format. Experience places through Matterport’s interactive 3D models online as if you are actually there: matterport.com/gallery. New York City – Leading 360-degree camera maker Insta360 and pioneering virtual tour platform Matterport today announced a new partnership that makes virtual tour creation easier than ever. The partnership lets virtual tour creators quickly capture a property in 360 degrees using the Insta360 ONE X camera, and then use Matterport’s software to create an interactive 3D floor plan and walkthrough, complete with depth and square footage data. The upshot is that pro-quality virtual tours can now be achieved by anyone, using Insta360’s run-and-gun flagship camera. The new partnership comes as part of Insta360’s increasing focus on the growing enterprise market for 360 cameras, which includes the launch of a new page highlighting 360 enterprise applications. Insta360 also announced upcoming integrations with a range of other popular virtual tour platforms, including iStaging, immoviewer, Cupix, VPiX, Kuula. Michael Shabun, Insta360’s Directory of Marketing, North America, said that Insta360’s goal is to become the premiere camera choice for virtual tour creators in the real estate, hospitality and tourism industries. The Matterport integration is currently in beta, with public release planned for March. Creating a virtual tour with Matterport and the Insta360 ONE X couldn’t be easier. After arriving at a property, creators connect to the ONE X via Matterport’s mobile app. Then, they simply follow the steps provided by the app as they capture 360-degree photos at key locations throughout the property. With the ONE X, all it takes is a single tap to capture a seamless 360-degree photo, and the camera’s 18MP resolution and automatic HDR mode make it perfect for interior photography. Once every room has been covered, creators can upload their photos to the cloud, and their content will be automatically converted into one of Matterport’s signature interactive 3D spaces, including depth and area measurements. The resulting virtual tour can be easily shared or added to a real estate listing. Creating virtual tours brings an immediate benefit to real estate professionals. A study from realtors.com showed that listings with virtual tours get 87 percent more views than those without, while another study from apartments.com showed that they generate 49 percent more qualified leads. The Insta360 ONE X costs $399.95 and is available today at Insta360.com, Apple.com, the Apple Store, Amazon and other select retailers worldwide. Insta360 makes innovative cameras that get the whole world in frame. Lightweight and versatile, they’re great for adventure sports, travel, journalism, live events, and for sharing experiences everywhere. Ricoh Theta Z1 in-depth review and comparison video posted! sure, and cupix too. But Matterport is much more well known, and has an excellent implementation of a 3d virtual tour, imho. Wow. This is quite a big deal. Interesting development. Still only monoscopic through. Hi Jon well it is monoscopic but i believe matterport builds a 3d model for it, which is why they can show it in dollhouse view. But i don’t know how detailed the 3d model is. I believe that in the long term, Matterport will decline, because its closed system of cameras, software and cloud, will be surpassed by the more affordable 360 ​​cameras for the pocket of the common people, this “update” and “low prices” from their cameras, they only show that the market is choosing more democratic solutions, and they can not keep them because of their high costs. i believe you are right. But Matterport does have a nice 3D interface. That could be a unique selling point, especially or high end virtual tours. Could this be done using the Ultracker Aleta 2C? Sorry, no. It only works with Insta360 and Ricoh for now. I think Z1 may work. But aleta… nope.